This is as much an opportunity for me to show off my shiny new Asus EEE PC as it is a chance to review it. There are plenty of reviews out there from people who have 'just ordered their eee pc', 'just opened the box', or for whom writing the review was the first thing they did on their new machine. All of these seem slightly premature. Its equivalent to reviewing a film before you have watched the ending! So, back to the topic. Unlike most people, I was not 'shocked' by the size of it. Unlike most people I can comprehend the dimensions stated on the Asus website (after all that's what dimensions are for). The screen size is 7in. Whilst the resolution is good, the screen is still only 7in. This means that when you open a program for the first time, it is necessary to spend 15 minutes fidgiting around with the toolbars and settings until every unnecessary pixel is removed. By far the worst offender is Open Office. It is annoying that Asus did not think to customise the programs (which they supply by default) so that they were best suited to the product. I am currently in the process of finding an alternative to Open Office which is not only lightweight but which has a simpler user interface. For me, the program I will (and have) use(d) most is the PDF viewer. CTRL+L is your friend (fullscreen). Viewing lecture notes during lectures and afterwards is effortless and almost as natural as reading the printed notes. Thunderbird is great to use and probably the best email client for this device. The split pane can be counter-productive on a small screen but once again, messing around with the settings can help enormously. 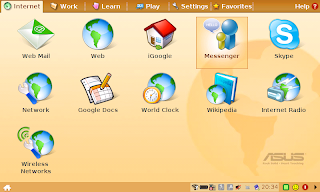 Most screenshots you will see of the EEE PC will illustrate the 'Simple' mode, inwhich the traditional desktop and start menu are replaced by a series of tabs with large icons pointing to all the installed programs. There is no denying that this is the simplest way to navigate programs on the EEE but it is not necessarily intuitive to the average Windows or Linux user. Fortunately Asus made it easy to revert back to the core Xandros distribution with the familiar desktop/start menu/taskbar. There is even the ability to boot directly into this mode or switch between the two. Side view of the Asus EEE PC, probably not its best angle (or my best photo). Front on. If only the side speakers were replaced by MORE SCREEN! In Proportion. Because everyone knows how big my hand is! Otherwise, a good review so far. Have you looked into rsync for synchronisation? I suspect it'll be a little lighter and easier to manage than SVN, though naturally it doesn't deal with version conflicts. As for office programs, the only realistic alternatives to OO.o are Koffice and AbiWord I think, though I don't think AbiWord is still in development. Koffice is probably worse UI wise than OO.o, <rant> though I'd hope KDE have enough decency to create something orignal, rather than blatently rip-off Microsoft's flawed design </rant>. I'm glad someone noticed the cheeky tag :-p.
I'll have a look at rsync, sounds like it might be a good alternative.